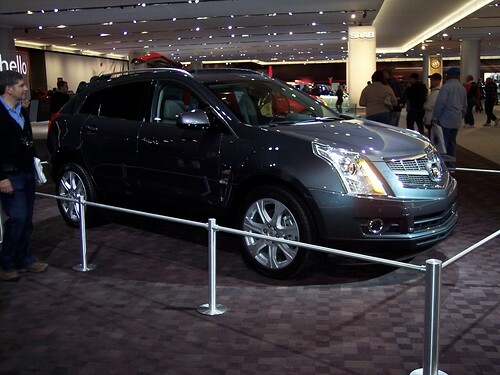 The SRX is Cadillac’s 5-passenger crossover model. It competes in the competitive midsize luxury SUV class against models such as the Audi Q5, Infiniti EX, Lexus RX 350, Lincoln MKT, and Volvo XC60. The 2012 SRX has a starting MSRP of 35,185. The model comes standard with a 3.6-liter 308 horsepower engine, providing ample acceleration to quickly get up to highway speed. The SRX has the most powerful standard engine of any luxury crossover, but still offers respectable fuel economy of 17-mpg city and 24-mpg highway with front-wheel drive and 16/23 with all-wheel drive. A 6-speed automatic transmission is standard. One area the SRX really stands out is safety. The model comes standard with six air bags, Bluetooth hands-free calling, and the OnStar® emergency response system is included for one year. New SRX owners also are eligible for Cadillac’s premium care maintenance for the first 4 years of 50,000 miles. This service includes free oil changes and tire rotations, which can preserve the life of the vehicle’s tires. The 2012 Cadillac SRX safety ratings are quite good, based on crash resulted provided by the National Highway Traffic Safety Administration (NHTSA) and Insurance Institute for Highway Safety (IIHS). In crash testing, the SRX received an overall NHTSA safety rating of 5-stars, the highest possible score. The SRX earned four starts for the rollover test but five stars in side and frontal tests, giving it a score of 5-stars overall. The model comes standard with six airbags. The IIH has named the 2012 SRX a “Top Safety Pick” making it among the safest SUVs of 2012. The SRX scored “Good” ratings in side, frontal, rear, and rollover strength testing. The new Saab 9-4X also uses the SRX’s platform. The 9-4X is also a “Top Safety Pick”. Cadillac SRX safety is another reason to consider this competent midsize luxury crossover that was significantly redesigned in 2010. Do you like the styling of the Cadillac SRX?